Gain further insight of your energy consumption to maximize system reliablitiy and optimize operational efficiency with our best-in-class power metering and monitoring solutions. APG offers turn key power monitoring systems to give you the tools to improve operational efficiency and ensure network reliability. 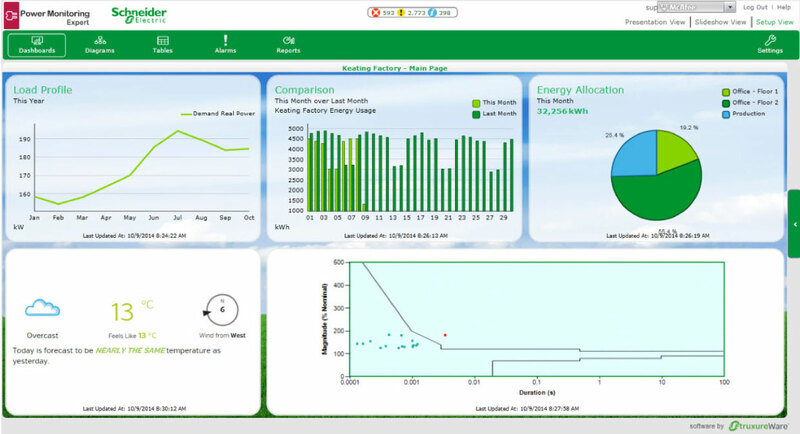 EcoStruxure™ Power Monitoring Expert is a complete supervisory software package for power management applications. The software collects and organizes data gathered from your facility’s electrical network and presents it as meaningful, actionable information via intuitive web interface. Share information with key stakeholders or across your entire operation to influence behavioral changes that can save you money. Power Monitoring Expert's open architecture supports industry standard protocols and an expansive range of Schneider Electric and third-party devices. Leverage and optimize your existing infrastructure. Integrate with other energy management and automation systems (e.g. SCADA, BAC, DCS, ERP) or web services.